Multiple seating options come to the All Terrain. GMC is in the enviable position of serving exclusively as a truck brand in a market where trucks and related utility vehicles are the desired choice for most new vehicle customers. Even as brands such as Buick and Cadillac play “catch up” in an effort to deliver the vehicles customers want, GMC simply must keep its product line fresh as customers flock to GM’s truck-only brand. Of course, the definition of “truck” as well as that of “utility vehicle” also includes car-based “crossover” models, such as the GMC Acadia. Now in its second generation, the 2018 Acadia continues to seize market share for a model that is smaller, lighter and faster than its predecessor. Introduced in 2017, the current-generation Acadia receives only minor updates for its second year — especially noteworthy is the five-, six- or seven-seat layout options in its All Terrain-packaged models. 2018 GMC Acadia All Terrain. First, let’s clear up any confusion about naming conventions as “All Terrain” doesn’t represent a GMC grade level. Instead, All Terrain is a package based on two grades — SLE-2 and SLT-1. Order either grade and the All Terrain option comes into play. Other trim levels include SL, SLE-1, SLT-2 and Denali. Second, the All Terrain and GMC Terrain are two very different vehicles. Just as the All Terrain corresponds to the midsize Acadia, the Terrain is GMC’s compact SUV. You’re forgiven if you confuse the two with the “All Terrain” badging affixed to the sheet metal on applicable Acadia models. But the Acadia is the next step up from Terrain, thus the two shouldn’t be readily confused. What isn’t lost on GMC fans were the seating options for various 2017 Acadia models — six- or seven-passenger placement for most models, except for the two-row only and five-passenger All Terrain. The thinking here was the All Terrain would provide minimal seating and maximum underfloor storage, but for 2018 GMC allows customers to choose either two- or three-row seating and space for five, six or seven passengers. GMC prices the 2018 Acadia from $29,995 (including $995 destination) for the base SL model powered by a four-cylinder engine and offered in front-wheel drive only. From there, you’ll find the SLE-1 ($33,595), SLE-2 ($36,195), SLT-1 ($39,495), SLT-2 ($42,895) and Denali ($46,095) grades. Most grades come with standard front-wheel drive. The V6 engine is available or standard with all grades except for the base model. Speaking of engines, GMC utilizes a 2.5-liter four-cylinder engine with 193 horsepower and 188 pound-feet of torque. Consider this model if you regularly carry one or two passengers and light loads. Otherwise, the 3.6-liter V6, generating 310 horsepower and 271 pound-feet of torque is the better choice, delivering a whopping 60-percent boost over the base engine. A six-speed automatic transmission works alongside each engine. Unlike the previous generation model which shared its wheelbase with the Buick Enclave, Chevrolet Traverse and the Saturn Outlook, the GMC Acadia parallels the Cadillac XT5 in size. The Buick and Chevrolet are all-new for 2018 (GM discontinued the Saturn brand in 2011) and ride on a stretched wheelbase version (120.9 inches) of the standard XT5/Acadia platform. Both are seven-passenger models and are exclusively powered by a V6 engine. Price the 2018 Acadia and you’ll see a varying level of equipment and amenities, arranging from standard fare to near-luxury features. Beginning with the base model you’ll find projector beam headlights, active grille shutters, heated power-operated side mirrors and 17-inch painted aluminum wheels. Exterior upgrades add automatic headlamps, LED daytime running lights, fog lamps, a dual-panel sunroof, 20-inch wheels and a power liftgate. Denali models add chrome embellishments on the grille, side trim, window surrounds, wheels and rear fascia. Inside, the standard equipment list includes keyless access and push-button start, a tilt-and-telescopic steering column, seven-passenger seating, cloth seats, power windows and door locks, a seven-inch color display, six-speaker audio system, 4G Wi-Fi hotspot, Apple CarPlay and Android Auto smartphone compatibility, three-zone automatic climate control, a rear vision camera and a Teen Driver minder. Interior upgrades include a heated steering wheel, power front seats with lumbar support, heated front seats, heated outboard second-row seats, leather seats, an 8-inch color screen, a 120-volt outlet and navigation. Move away from the base model and you’ll find multiple package options available. GMC rolls some packages into higher trims with those same packages varying in price by trim. A Black Accent Package ($1,195) brings in a black finish grille, dark finish tail lamps and dark finish rear license plate trim. A Driver Alert Package ($790) is an SLE-2 option, adding rear cross traffic alert, rear park assist and lane change alert. The Denali offers a Technology Package ($1,395) bringing in such advanced driver-assist features as adaptive cruise control, forward automatic braking and a surround vision system. As for the test model at hand, GMC supplied a 2018 Acadia AWD SLT-1 vehicle ($41,560). Included options totaling $6,000 raised the price accordingly, bringing in the All Terrain Package, dual-pane sunroof ($1,400); Exterior Convenience Package ($860, with roof rack cross rails and molded assist steps); Trailering Package with Active Tow ($650); a Crimson Red Tintcoat finish ($495), navigation ($495) and a $300 interior package with floor mats and a cargo mat. Add in the $975 destination charge and the sticker price on this model came in at $48,535. So, exactly what does the All Terrain model deliver? Several things, beginning with 18-inch machined aluminum wheels with dark accents, black roof rails, rear air vents and dual-outlet exhaust. The package also adds hill descent control, a 3.16 rear axle ratio and advanced all-wheel drive. The package alone is a $2,045 option ($1,800 SLT-1), but also requires customers choose the V6 engine and all-wheel drive. Like other manufacturers utilizing all-wheel drive to improve off-road functionality, GMC engineers found ways to mimic a rear differential to give All Terrain models an edge. For starters, you’ll find a dual-clutch all-wheel drive system, tasked with not just sending power to the rear wheels, but detecting which wheel has the most traction and distributing more power accordingly. It is a dial-managed system that allows owners to switch between front- (2WD) and all-wheel (4WD) drive modes. For improved off-road capabilities, move the dial to All Terrain where torque management, stability and traction control become optimized for improved traction on muddy or sandy surfaces. As for hill descent control, this tool works with the Acadia’s anti-lock system to supply a smooth and controlled descent at a set speed. No need to apply the brake pedal as the system takes over. In fact, it is a foot-off-the-brake and hands-on-the-steering-wheel experience as you make your descent. I was happy GMC supplied me with a V6 engine. The worst thing a manufacturer can do is provide a journalist with an underpowered engine as we tend to focus on what we don’t like and magnify same. So, this means I’m recommending you begin your search with a V6 in mind. This also means the base model is out…no surprise there. An all-wheel drive model is worth considering if you live in a wintry climate or want an extra bit of handling edge on slippery roads elsewhere. It comes in handy in other instances too — more than once I floored the Acadia and set the front tires screeching. After the third time, I simply switched to all-wheel drive, effectively bringing the balance I prefer when driving an SUV. The Acadia’s 310-horsepower V6 is no sluggard. You’ll enjoy ample off-the-mark acceleration and excellent passing power. The transmission shifted with precision, although on one frigid morning it seemed as if the powertrain needed to build some heat first before working smoothly. My lone surprise with the V6 is that it comes paired with a six-speed automatic — one or two additional cogs would likely help improve on its combined 21 mpg rating. The 2018 Enclave, by the way, pairs this engine with a nine-speed automatic. Head off road at your own peril. Okay, I’m kidding. Just cautious. The Acadia handles unpaved surfaces with ease, provided you avoid deep mud or wet sand. I wasn’t about to push the Acadia beyond light-duty work…getting stuck without backup support is not my ideal way to test drive a vehicle. 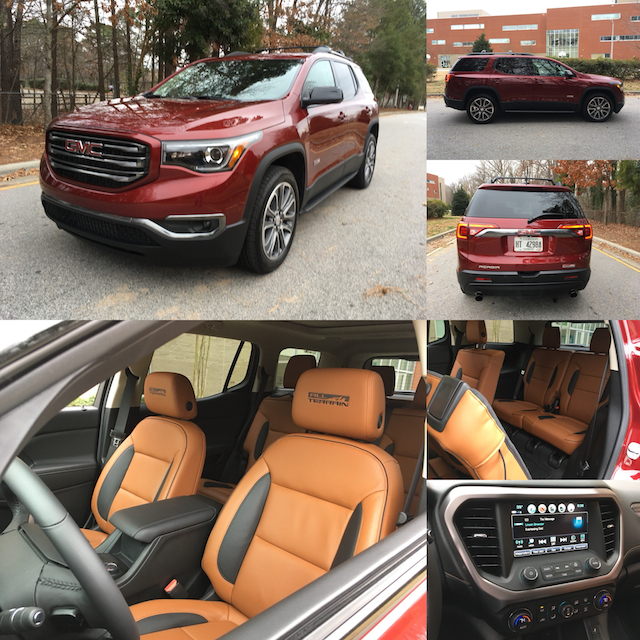 The 2018 GMC Acadia checks off all the marks for a midsize SUV, although the interior isn’t as roomy as its corporate siblings from Buick and Chevrolet. 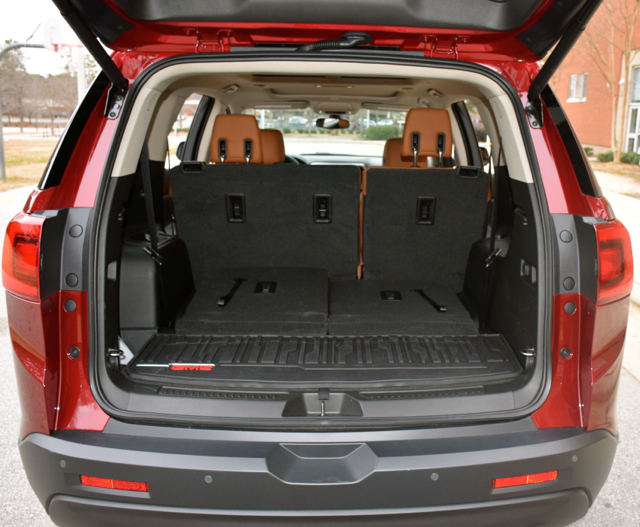 Consider it the ideal model for anyone wanting four or five-passenger usability, with the rear seat useful in a pinch, but best kept folded to store your cargo items. Lastly, pricing can climb very quickly and that’s something to keep your eyes on. A well-equipped model will likely top $40,000, although discounting can bring your SUV’s final cost to that financial threshold.